WINNIPEG, Dec. 17, 2018 /CNW/ – Artis Real Estate Investment Trust (TSX: AX.UN) (“Artis” or the “REIT”) announced that its trustees have declared a monthly cash distribution of $0.045 per trust unit (“Unit”) of Artis for the month of December, 2018. The cash distributions will be made on January 15, 2019, to Unitholders of record on December 31, 2018. As at the date hereof, there are an aggregate of 151,903,307 Units issued and outstanding. 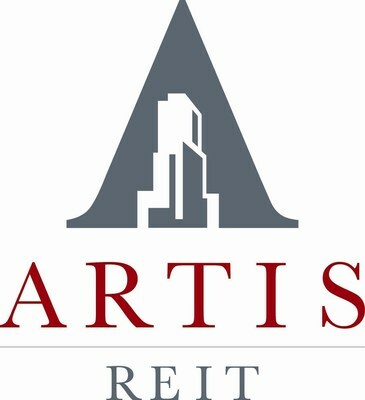 Artis is a diversified Canadian real estate investment trust investing in office, retail and industrial properties. Since 2004, Artis has executed an aggressive but disciplined growth strategy, building a portfolio of commercial properties in British Columbia, Alberta, Saskatchewan, Manitoba, Ontario and select markets in the United States. As of September 30, 2018, Artis’ commercial property comprises approximately 24.8 million square feet of leasable area. During the three months ended September 30, 2018, Property Net Operating Income (“Property NOI”) by asset class, including Artis’ proportionate share of properties held in joint venture arrangements, was approximately 52.6% office, 20.4% retail and 27.0% industrial. Property NOI by geographical region, including Artis’ proportionate share of properties held in joint venture arrangements, was approximately 3.0% in British Columbia, 21.0% in Alberta, 6.5% in Saskatchewan, 13.6% in Manitoba, 11.1% in Ontario, 10.4% in Arizona, 18.1% in Minnesota, 8.8% in Wisconsin and 7.5% in U.S. â Other.